What did you like about the book? The arrival of the New Horizons spacecraft at Pluto in July 2015 was a huge event for astronomers and astronomy enthusiasts around the world. This book opens with a large crowd gathered to celebrate the moment when New Horizons made its closest flyby of the mysterious dwarf planet. This comprehensive volume does a great job transmitting to readers the excitement and significance of the spacecraft’s nine-year journey, and the wealth of information we are now learning about Pluto. It also delves into how it all began, with Clyde Tombaugh’s discovery of the planet in 1930. Readers learn about the process of getting the mission approved by NASA and the challenges faced in designing a spacecraft capable of traveling so far from home. Each chapter concludes with a two-page “Mission Brief” spread, providing key facts to readers who may be a bit overwhelmed by all the information packed here. This book is heavily illustrated, including some of the amazingly detailed photographs obtained by New Horizons. The photographs also focus on the teams of people behind the New Horizons mission, noting that about one-quarter of the team is female. The book includes a glossary, author’s note, index, bibliography, note on sources, and suggestions for readers looking to learn more about Pluto. This is a great STEM book. Anything you didn’t like about it? This is a terrific book. Young readers might not have the patience to read every word, but even just browsing it will give them a lot of information. It might be a fun family read-aloud because there is so much text. To whom would you recommend this book? Read Alikes? 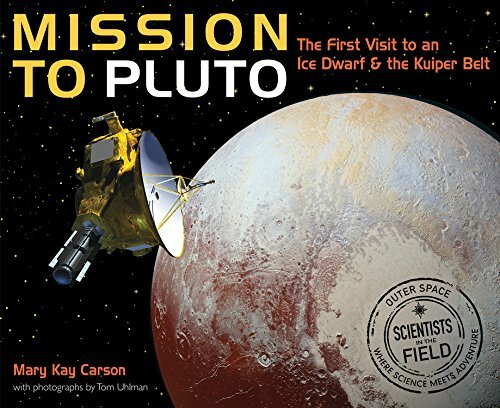 Recommend to space enthusiasts and students writing reports about Pluto or the Kuiper Belt, especially in the book’s target range of grades 4-6. Also recommend Team Moon: How 400,000 People Landed Apollo 11 on the Moon by Catherine Thimmish. Who should buy this book? All public libraries, elementary schools and middle schools should have this book. Should we (librarians/readers) put this on the top of our “to read” piles? Yes. It’s a fascinating book and worth a perusal. This entry was posted in *Starred Review, Book Review and tagged Houghton Mifflin Harcourt. Bookmark the permalink.